Gills RSD (CRPS): DARKER DAYS ? The pain in my foot has gone back to really burning and being sensitive again, almost like when I was first diagnosed. My foot is very cold but burning most of the time have taken a few more tablets than usual. Woke up with really bad pain in toes just like somebody breaking them, my leg went into spasms then the worst of pain went. The next day my foot was extra painfull when placed on the ground. Today I received a letter from LINCOLN COUNTY HOSPITAL with 3 apologises for the way I was treated when in hospital [9TH -24TH July] so maybe next time I am in hospital the treatment will different RSD is not to be taken lightly it does not like change unless it does its self. This weekend went to see my son Wayne in Halifax painful journey there, made my neck very stiff and sore. Foot also reacts badly to vibrations in the car. Good weekend journey home not as pain full. Have started taking 1 CLONIDINE morning and night. 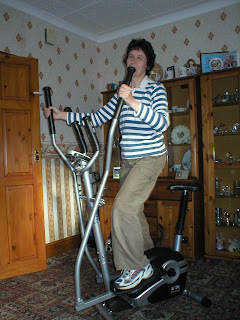 I am still getting dizzy on standing so may be this will help, it is a lot better for me than PROBATHINE. But one of the bad side affects is dizziness from blood pressure dropping and staying low but it really does help the RSD sweats. I have bean getting a lot of tingling in shoulders and back, going down my right side, worse across the shoulders. Still getting pain in left hip, getting worse. First ride back at running club, mixed feeling, all of them were pleased to see me back. Biked about 12 miles most peddle power, some electric. Physio today, asked Wietse about tank. He said it would not be advisable at the moment, as he thinks I am not strong enough yet to take 3 sessions a week - which is what I would have to do as bean out so long. My doctor agreed with him. Physio went much the same as usual. Was advised by Michelle (another physio who works with Wietse) to drink green tea (high in anti-oxidants). She said would help with bloating and digestion. Not very keen on it but willing to give it a try. I got some with jasmine & some with lemongrass - like the lemongrass one the best. I asked Wietse about a cross trainer he said I could get one so long as it had a seat (bike cross trainer). Will be getting one very soon. Got the cross trainer today feels quit strange to use. I am allowed 5 minutes biking, 5 minutes standing up as running mode twice a day. Foot is very stiff & does not bend but will adapt to that, its the nearest thing I am going to get to running. The room was nice, the bathroom had a corner bath plus shower(ooooh!). The meal was quite posh - meaning very small and rich, not bad but I prefer a normal meal. I did not think it would be enough for Paul as he eats a lot, but he said it was. Saw my doctor today for monthly checkand more tablets told him I felt very down he said it was hardly surprising. He would get me some counselling to see if that helps. Meeting for counselling talked and told him how I felt. He said he could get some next year as there are big waiting list its a good job I am not too bad at the moment. Having a job to walk without pain somewhere in body hopefully it will be sorted out at physio. Physio today missed last week as they were having a new floor fitted so this week was in a lot more pain than usual. 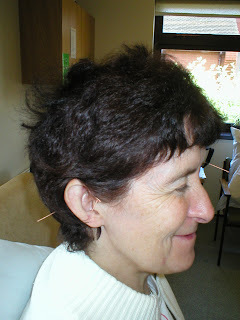 Wietse put needles in ears, hands, forehead and neck. 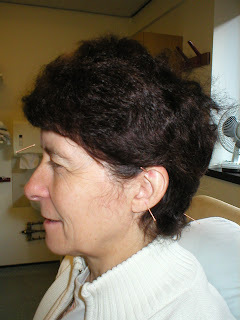 The neck one attached to electrics, the right side neck one came out the electric pulse really hurt my neck. Wietse popped another one back in, that was better. He just held my foot today and warmed it, as was sensitive and painful, he massaged my hip and stretched my leg it really hurt, hopefully this will help. 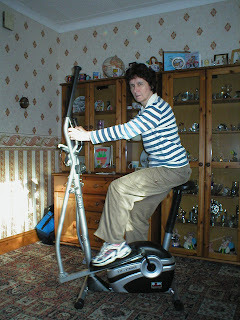 Hip not as tight foot hot, burning and cold a lot of pain, still tingling down right side, may be over did the cross trainer, as went on longer, early hours of last night, or was it the WII (games console). The weather is getting very cold not a good thing for us RSD people, could be why getting extra pain. Well see you all next time love Gill.